By roserowson, November 30, 2014 at 8:55 pm . During the showcase for nai010 uitgevers, we were shown a new mobile application developed by PUNTPIXEL and Medamo. 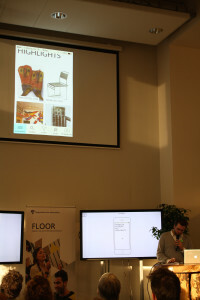 My Highlights lets users create their own, personal ePub from the collection of the Stedelijk Museum in Amsterdam. The application allows users to search by genre, period, artist and so on to assemble their own personal impressions from the collection, and prioritise content. Presenters Marc de Bruijn and Barbara Lateur noted that this form of curation could be used, for example, by a layman wishing to plan their visit to the museum, or a student planning for their thesis. Moreover, the model could easily be transferred to any practice with diverse and structurable data requiring this type of cataloguing, such as a stamp collection. When demonstrating the application via an iPhone projection, Marc de Bruijn showed how to navigate the interface of My Highlights. Information on different pieces in the collection is available for free, while users may choose to pay a small amount for additional material such as essays on artists and individual works. This aspect of the application is still in development; when it is fully operational, users will be able to compile their ePub, pay for any additional content using an inbuilt payment gateway and export their final product, to be viewed online within My Highlights, or offline in the external application of their choice. The mock-up version of the iOS application de Bruijn showed us was created using Phonegap and WordPress to mimic the functionality of the final version. As an application concerned with creating ePubs, de Bruijn noted that the final versions of user curated ePubs may well be viewed in an external application. With the wide range of these applications available, this is arguably a concern for any group in the business of producing ePubs. Upon its launch, we shall see how successfully content from within My Highlights can be viewed outside of its sleek interface.